A ll set for a delicious Mexican holiday treat? Here's an authentic Rosca de Reyes recipe. The results are just like you'll find in most every home (and bakery) in San Miguel de Allende. But what exactly is Rosca de Reyes? Sometimes called Mexican Christmas Bread, this "Ring of the Kings" is a sweet bread. It is served on Three Kings Day, or Epiphany, January 6th, the day the Three Wise Men arrived at the manger in Bethlehem and presented the baby Jesus with gifts of gold, frankincense and myrrh. Although Santa Claus has made inroads in Mexico in recent years, Three Kings Day is still the traditional gift-giving holiday for children. They set out their shoes the night before in hopes the Kings will fill them with toys, gifts and candy. In San Miguel de Allende, a Three Kings Market takes over all of Calzada de Guadalupe and runs all night January 5th, with prices dropping as dawn nears. Three Kings Day is a happy, noisy holiday, with a parade through San Miguel's centro. Kids dress up like their favorite kings&@8212often complete with blackface for the Moorish kings. There will be music in the Jardín and a very festive air. And of course there's a party. This is Mexico! And that's where we find the Rosca de Reyes, or Three Kings Bread, looking like a wreath or a king's crown and decorated with strips of candied fruit and orange and lime peel, like bright jewels. The bread is cut carefully because hidden inside one piece will be a small baby doll, traditionally made of porcelain but now more commonly of plastic. The hidden doll symbolizes a safe haven where the infant Christ could be born safe from Herod's army. Whoever gets the slice with the baby has to play host to the whole group at the next party, held on Candelaria on February 2nd—exactly 40 days after Christmas. Sprinkle the yeast onto the warm milk and set it aside for ten minutes. Meanwhile, cut the candied fruits into strips and set aside. Sift the flour with the sugar, salt, cinnamon, and anise seed. In a large mixing bowl, combine the yeast liquid, eggs, butter, vanilla, orange flower water and orange zest. Mix in the dry ingredients a half-cup at a time, mixing well after each addition to form a soft dough. If it's too soft, add more flour a bit at a time until the dough can be worked. Knead 5-10 minutes, until it becomes smooth and elastic. Set it in a greased bowl, cover with a cloth and let rise in a warm place until doubled in size, about 2 hours. Punch the dough down and shape into a simple or braided ring or oval. For a simple ring, just form the dough into a long roll, loop it into a ring, and pinch the ends together. For a braid, divide the dough into three parts, form three logs and braid them together, then pinch ends together to form a ring. Insert the baby doll into the bread and smooth over the hole. Place the ring on a greased baking sheet. Lay the dried fruits on top in stripes, pressing it lightly into the dough to stick. Let the bread rise again until doubled, about an hour. Preheat oven to 350 degrees. Brush the top of the bread with the beaten egg, and sprinkle heavily with sugar. Bake for 303-45 minutes, until it's golden brown and sounds a little hollow when you thump it. Let cool on a rack before cutting. Note: You can omit the orange flower water if you can't find it. It's just a nice touch. For an authentic detail, look for biznaga, or candied cactus, in Mexican grocery stores. 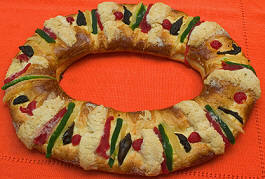 Do try this Rosca de Reyes Recipe for your Three Kings Day party. Serve it with Mexican hot chocolate or hot atole. Pssst: If you're not into baking your own Three Kings bread, join the hoards of Mexicans haunting the bakeries of San Miguel de Allende looking for the perfect Rosca de Reyes to take home. You'll find them in every style and size. My personal recommendation? La Colmena—popularly known as "The Blue Door Bakery"— on Reloj one-half block downhill from the Jardín, on the right.